At an extraordinary meeting on Wednesday, April 3 and lengthy debates, the government's spending plans crossed with 59 votes in favor and 34 votes against. In the vote, opposition members of the Harmony and Greens and Farmers Union (ZZS) parties were joined by three rebel members of the coalition party KPV LV (Karina Sprūde, Linda Liepiņa and Didzis Šmits) and former KPV LV member Aldis Gobzems, now an independent after being booted from the parliamentary party. Another indpendent, the Harmony-aligned Jūlija Stepaņenko, also voted against the budget. The debate saw 91 amendments tabled, mostly by opposition parties, but the government stuck to its promise not to back any of them. Previous budget debates have raised public ire with so-called "members' quotas" being used to add expenditure for projects of questionable merit. As previously reported, budget revenue for this year is planned to amount to 9.2 billion euros and expenditure to 9.4 billion euros. Defense spending is maintained at the 2% of GDP level recommended to its members by NATO as the acceptable minimum, with a 60-million-euro increase. 7.2 million euros will be channeled to implement the action plan for the implementation of Monyval's recommendations on money laundering and terrorist financing as part of the financial sector clean-up. 168,000 euros is also earmarked for digital publication of formerly classified KGB documents. In order to secure national defense funding, it is planned to divert EUR 60.3 million to two percent of GDP this year. The general government budget deficit is planned to be 0.5% of GDP this year. In turn, GDP growth in 2019 is projected at 3%. Winding up the debate, Prime Minister Krišjānis Kariņš (New Unity) underlined his previous assertions that the 2019 budget was a "technical" budget largely devoid of contentious measures in order to get it passed as quickly as possible, and that more radical budgetary moves would be forthcoming in future budgets. "This is just the beginning. We have adopted a technical budget," said Kariņš, promising that on Thursday, April 4, the government would begin preparing for the 2020 budget. 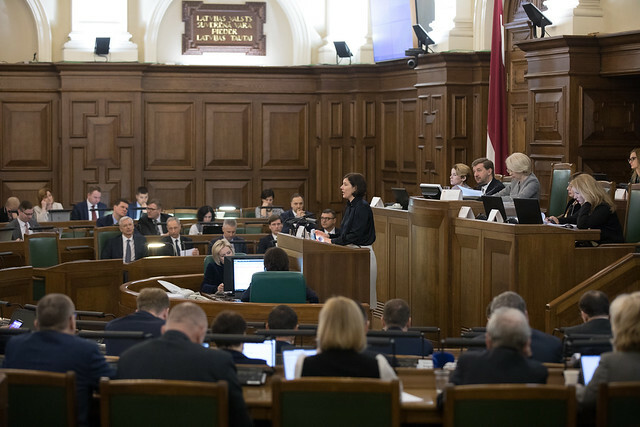 The lengthy government formation process following parliamentary elections on October 6, 2018 delayed the passing of the annual budget, which usually makes its way through Saeima towards the end of the preceding year.